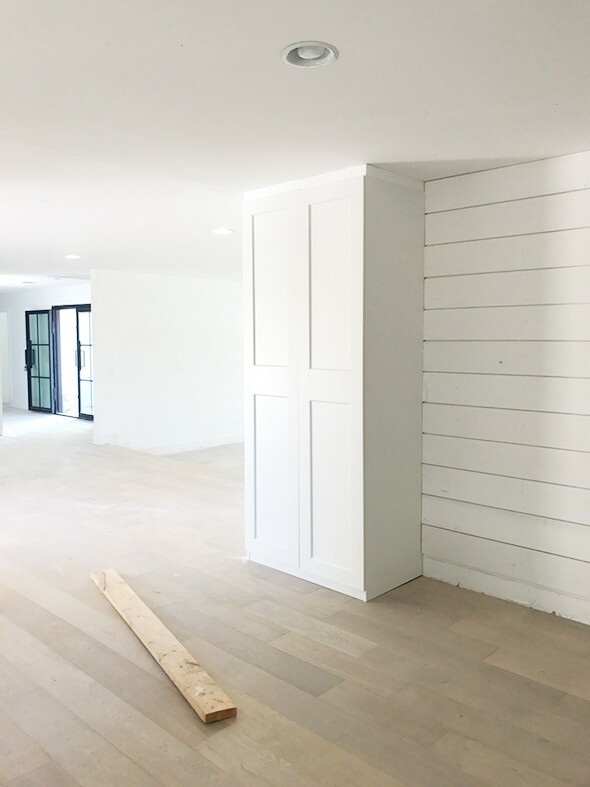 Just off the dining room in the Gentry project house, and next to the office we showed you last week, is a casual family room and mudroom space. 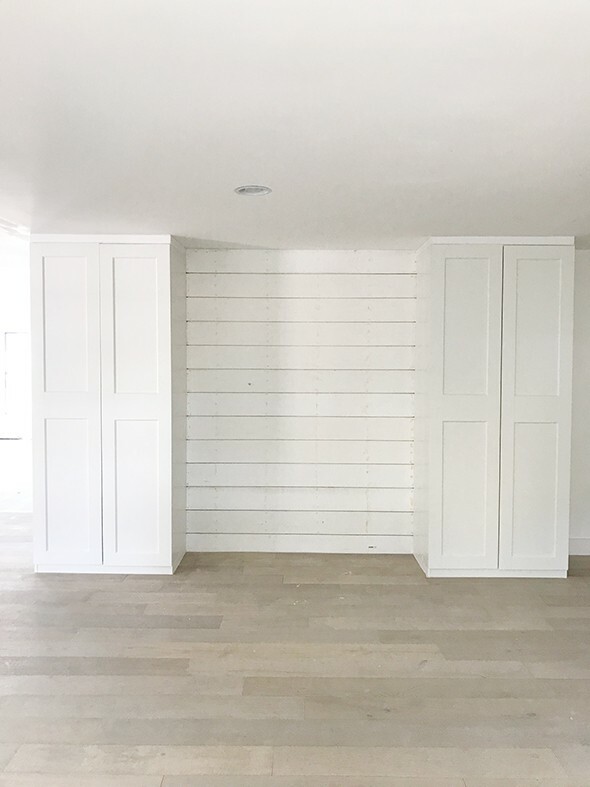 Considering these rooms used to be an exterior workshop, I think these spaces turned out beautifully and help this house flow SO much better! 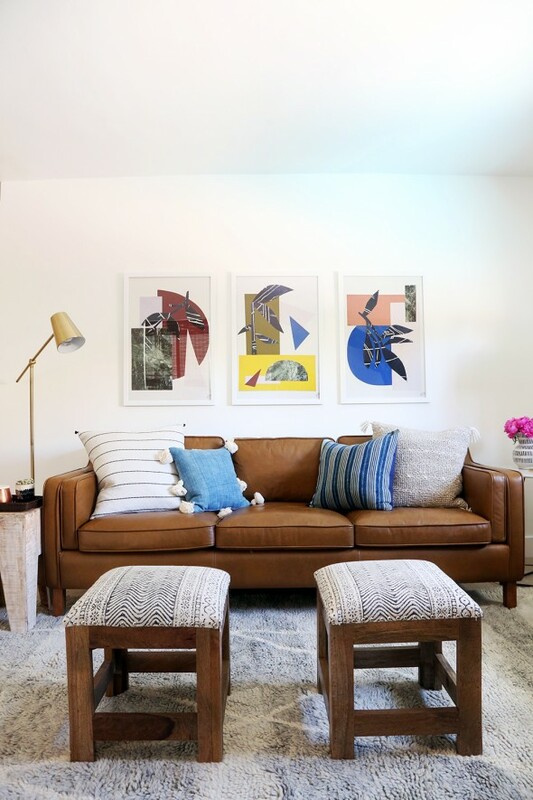 In this family room space, we hung three new prints from Canadian artist Holly Young that are now available in the print shop – Collage I, Collage II & Collage III! I’m obsessed with this cut paper collage series! 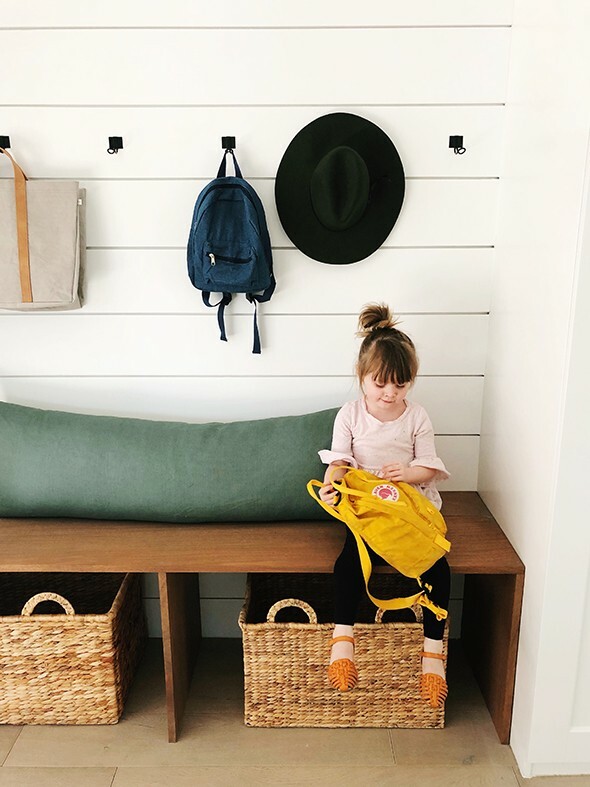 The door to the garage is just to the right of this photo, so we thought a small-but-mighty mudroom area that offered closed storage, a bench with baskets and hooks for bags and backpacks would be the perfect addition to this pass-through space. We used these wrought iron pulls on the doors, also from IKEA. We used these in the kitchen too and I couldn’t love them more. They are heavy and have great proportions! I designed the wood bench and our contractor built it out of mahogany (the same wood we used on the mantle and the kitchen shelving). 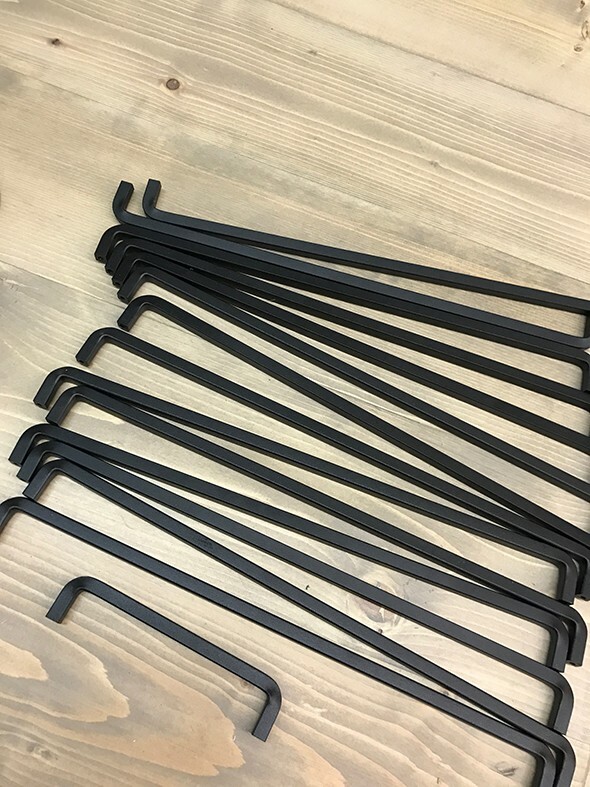 We used these petite hooks that were insanely affordable and I love the matte black finish! PS how cute is that tiny denim backpack?! I found it at Michael’s for $8! 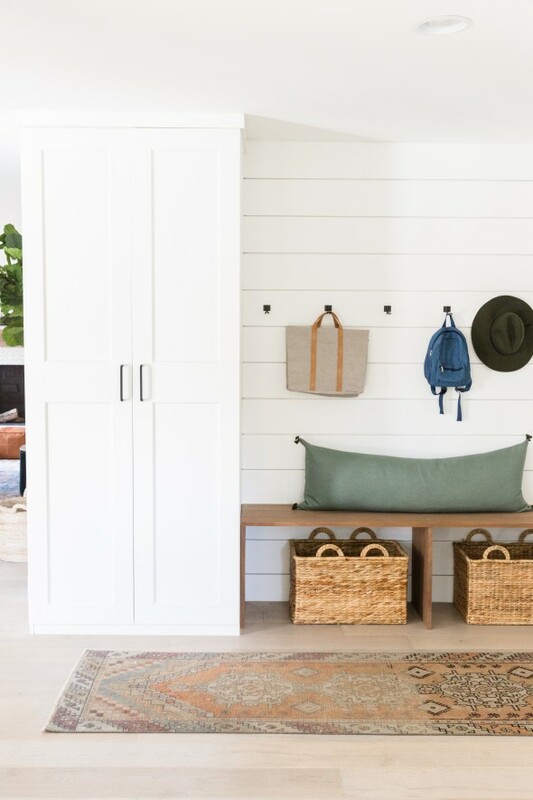 I would love to have a mudroom like this–beautiful and functional. 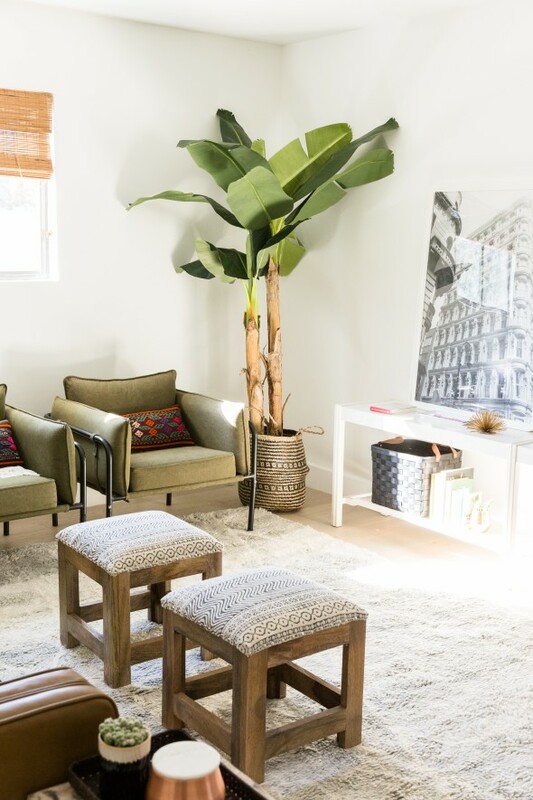 The family room is cozy and a perfect kid room. 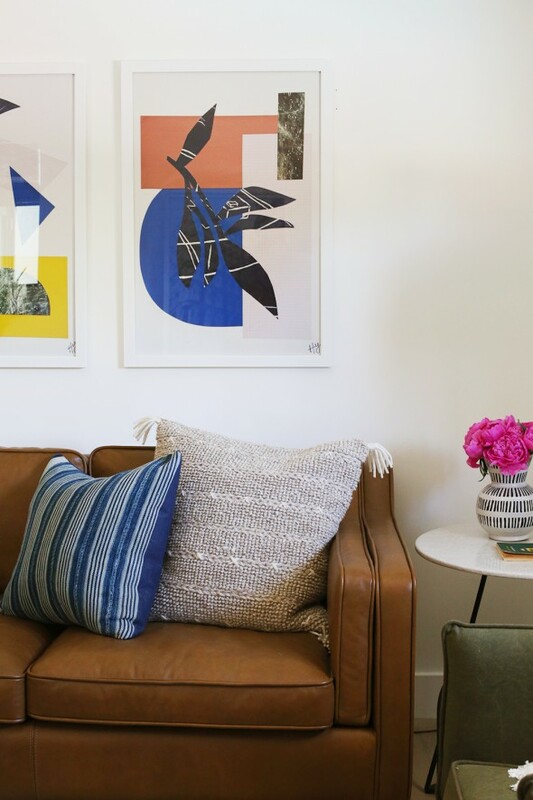 Those new prints are so different from the other artwork in your shop; they are a really great addition! Did you paint the Pax cupboards, or no? Nope! We left them as is and the white matches perfectly! I love this!! Would you mind providing a source for the large white frames? These are the Tyler frames from Michaels! Any chance you have the source for the actual rug you used? I love it! Genius use of space! That mudroom area looks like it was meant to be there. Nice work! I’m really enjoying the Gentry reveals. A tour of my house would reveal something from an LGN post in almost every room, ha! 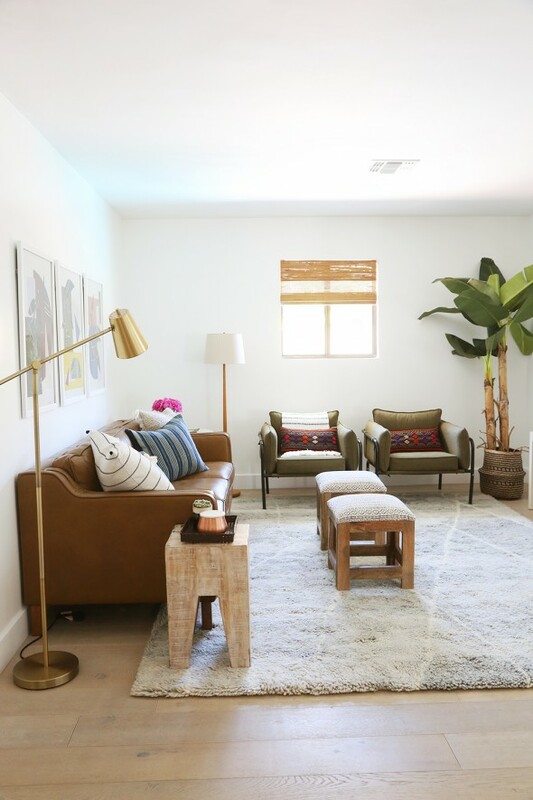 The white strap dining chairs from world market, the amazon dining chairs you just posted, two club chairs you posted 5+ years ago, brown leather couch, faux trees everywhere (now a convert) and now the 2 overstock mudcloth stools! SO happy to have LGN as a resource!! I don’t want to stay tuned for the pillow collection… I want it NOW! That little mudroom! What a great use of that space. I have been looking for a pillow insert that size FOREVER after seeing the pillow you made for Joanna Goddard’s bedroom years ago. I just purchased some Marimekko fabric for a couch pillow cover and I’m looking for that size of insert. Any chance you can share a retail resource or at least the dimensions of the pillow so I can search for it on my own? Where are all the frames from on the gallery wall in the kids room? 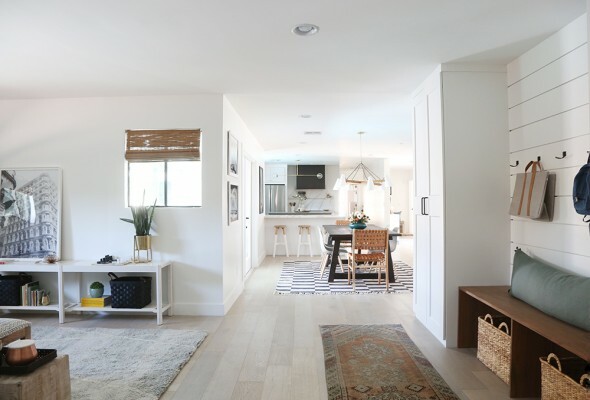 I’ve been eyeing the Howell chairs from UO since you used them in a previous project, but it doesn’t look like it is in store anywhere near me for a “test sit.” :) Any comments on the comfort of the chair? Cushy enough for lounging/movie watching? I’m looking to add some side chairs in our living room for extra seating and am having trouble finding the right fit…form v. function. :) Loving the Gentry room reveals! I wouldn’t describe these as lounge chairs. They are on the small side and the cushions are a little stiff. They are GREAT for sitting rooms and an hour or two of conversation, but I probably wouldn’t choose to sit in them to watch a show. Hope that helps! love it ! 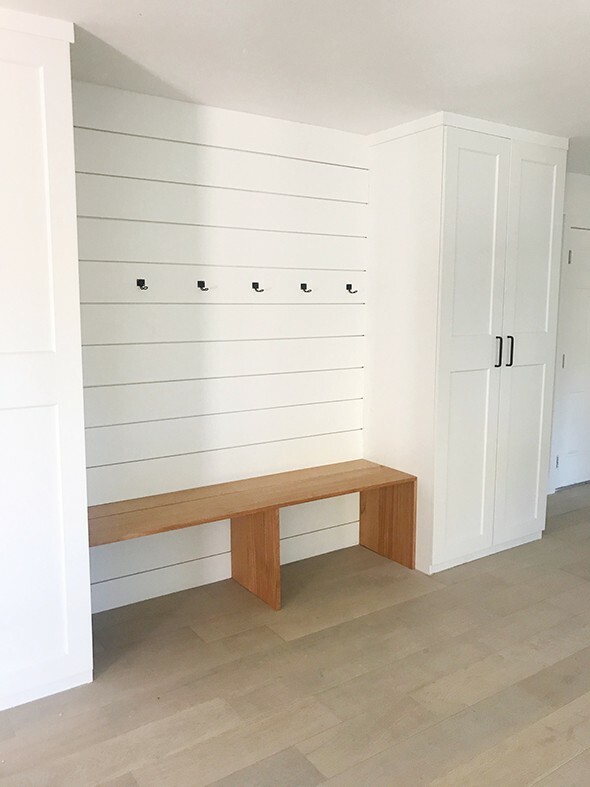 would you mind giving the total lenght of your mudroom (from on end on the pax to the other) and the lenght 0f your bench? 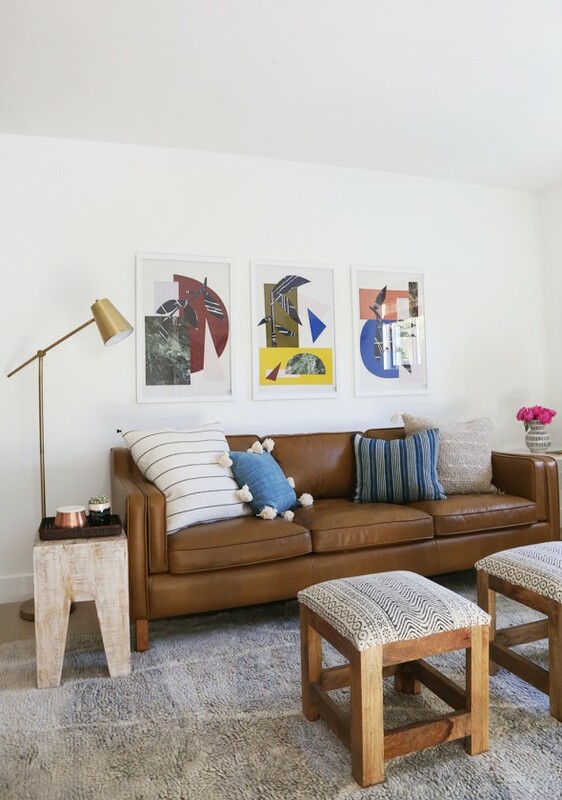 Such a beautiful and cheerful space! Perfect for a family! Would you mind sharing the details on the beautiful front double door? 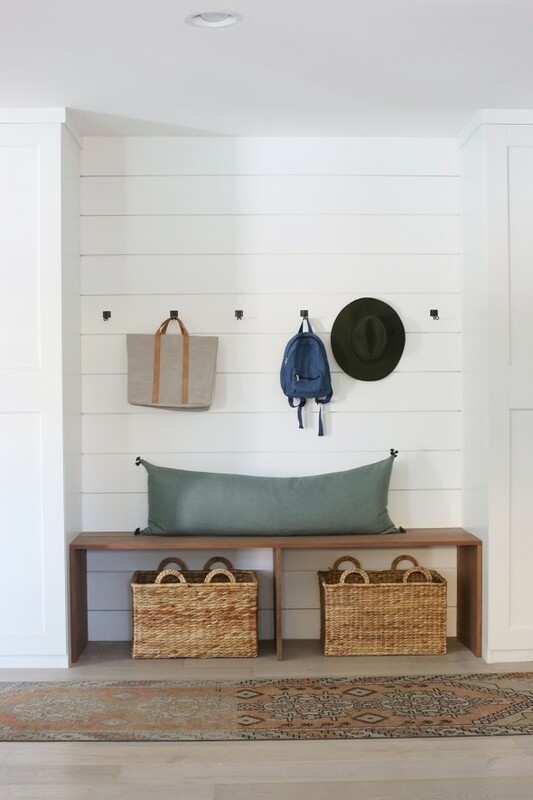 Love the mud room and want to do something similar. Did you just color match the crown trim to match the IKEA white cabinets?? Or did you paint the cabinets and the trim a new color?? Thanks!